There are various Tesla production “trackers” out there. None of them are perfect. Who knows what the heck is really going on anyway? And even when Elon Musk himself seems to know what’s going on, a new hiccup (or dagger from the devil ruling production hell) can end up changing the story. That said, recent indicators I’ve seen imply that Tesla is approaching a solid 7,000+ cars a week again. But let’s rewind a bit. 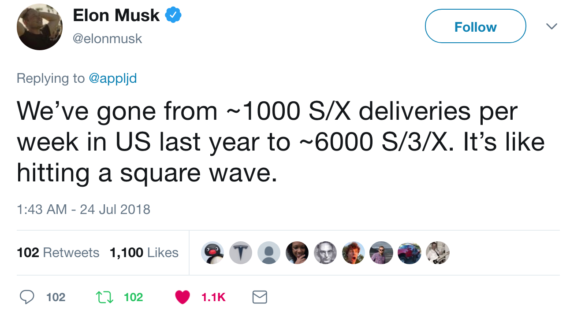 On July 1, Elon tweeted that the company had produced 7,000 cars in 7 days. So, what are we talking about now, almost a month later? Well, that was what the cool kids are calling a “burst week.” The challenge after achieving that was to stabilize production at such a high rate. Apparently, there’s a whole 2 steps forward, 1 step back, 3 forward, 4 back, 5 forward, 3 back kind of thing going on — or something like that. We’re again approaching the end of the month and maybe production is just “bursting” for a short time, but there seems to be a broader expectation that it is steadily improving and rising. 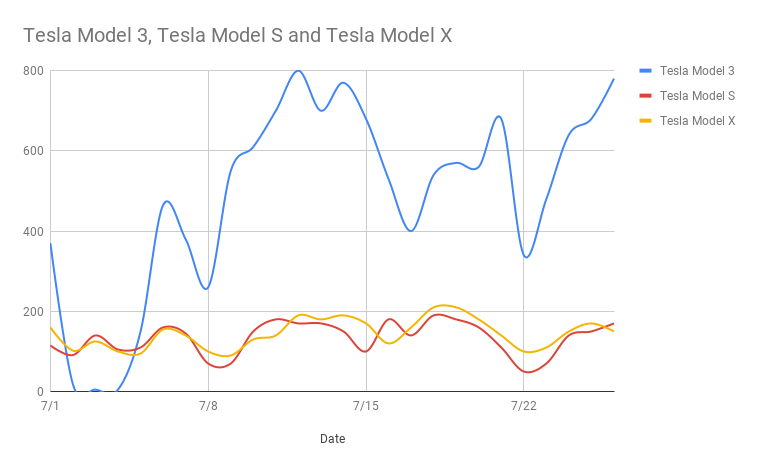 Also, when checking out the numbers and charts below, recall that Tesla has added new configurations to the ordering options (AWD and Performance Edition options) in recent weeks, which could explain a couple of drops in production that were followed by gradual, steady rises. Let’s start with “the dude” himself. 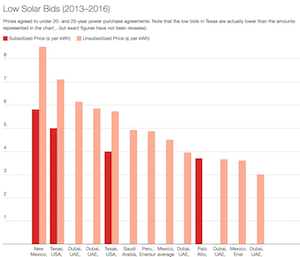 He indicated a few days ago that Tesla has risen to ~6,000 Model S, X, and 3 per week, but many people have taken that ~6,000 to mean just the US because of what prefaced it, which could mean ~7,000 globally. Either way, we’re getting up there. There are certain people who claim to track daily production numbers out of the factory. In particular for this story, there’s a Twitter user named “skabooshka” who claims to receive daily production numbers from a reliable source. Reportedly, this person rounds the received numbers to an even number (supposedly to prevent getting busted) and shares them on Twitter. I have seen no solid evidence this person, who appears to be a firm Tesla bear, is getting or sharing accurate production numbers, but it seems a lot of people are watching and at least half-presuming they are legit. If you look at the broad trend, you see slow production growth over the past month, with some dips and with some days over 1,000/vehicles a day. The last update put yesterday’s daily production total at 1,100, with 780 of those being Model 3s. Of course, 1,100/day = 7,700/week if you extrapolate. Last but perhaps not least (who knows? ), there’s the Bloomberg Tesla Model 3 Tracker. 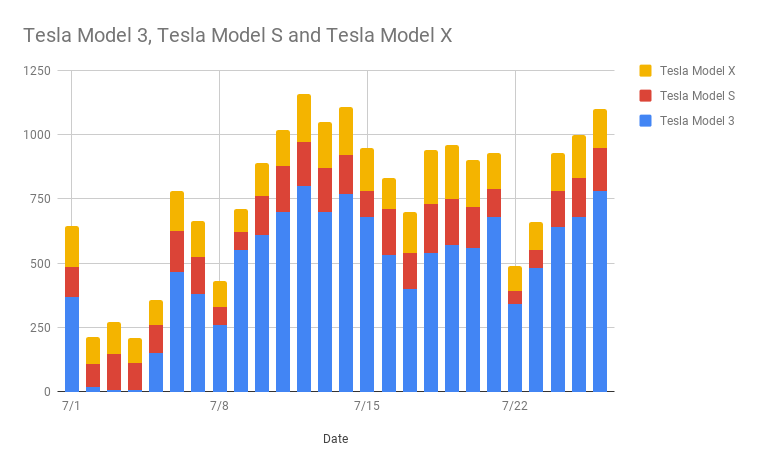 The estimates there don’t actually show the ~7,000 a week production total Tesla hit at the end of June unless you expect an abnormally large portion of those came from the Model S and Model X, but the tracker has since shown some solid growth, getting up to a Model 3 production rate of 4,330/week. 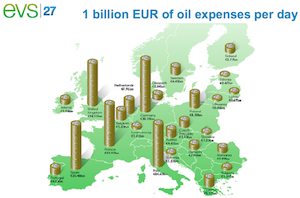 The tracker now estimates that 6,000/week is around the corner. We’ll see. Production may be all your care about. 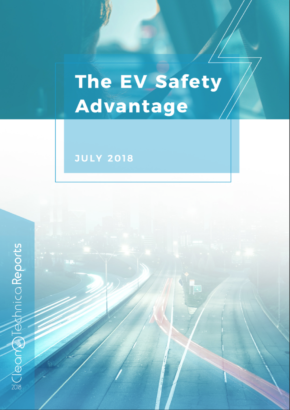 However, many people are more concerned with Tesla’s finances and stock price than number of vehicles produced. 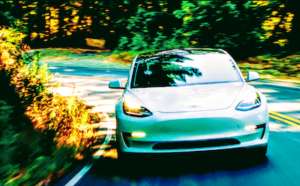 In that respect, it’s worth noting that Tesla recently started producing higher-trim versions of the Model 3, such as the Performance version of the Model 3. 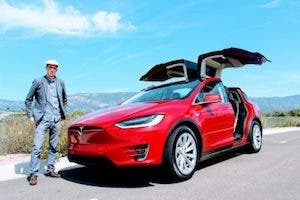 (For more on that option, see our review: “Tesla Model 3 Performance vs. Tesla Model 3 Rear-Wheel Drive.”) The higher the trim, presumably, the more cash Tesla will take in profits. 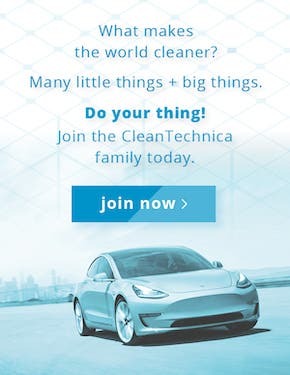 So, whereas producing 5,000 Model 3 Long Range units a week may be necessary for Tesla to achieve a net quarterly profit, one can presume Tesla could produce fewer Tesla Model 3 Performance Edition units a week for the same net financial effect. Also, the drops in production in the past couple of weeks were likely a result of rolling these new, higher-margin trims into the production process. If you want to play games with the many numbers and options, check out Vijay and Maarten’s new SimTesla game.